No doubt sensing my double vulnerability, an opportunistic blood sucker seized her chance. (Yes, it's always the females, having just mated, looking for that blood meal that brings forth the baby business). 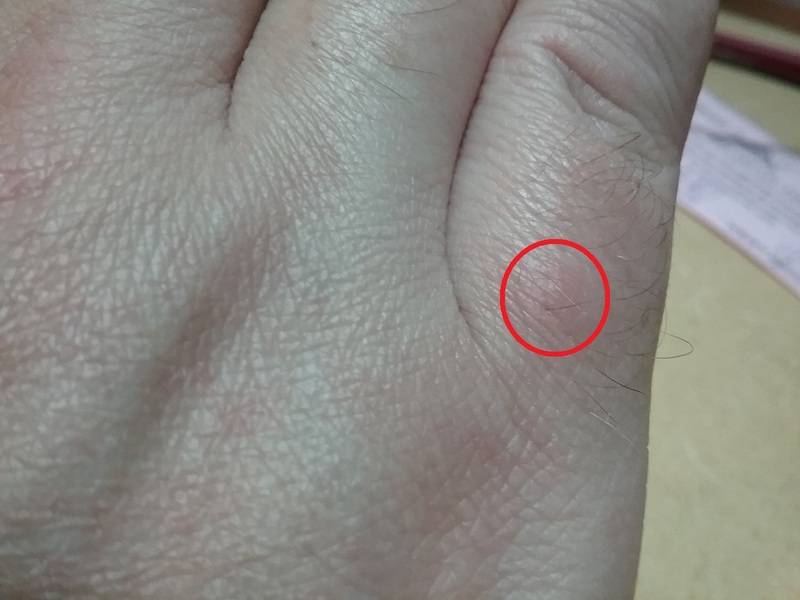 I didn't notice the brutal vampiric attack in progress, but within a few minutes an itchy red bump swelled up on my right pinky finger, below the first knuckle. Given my experience, I knew right away what had happened! So (after a quick self-huddle) I promptly initiated my planned response for violent emergency situations: I approached the nearest group of local police. (I did not take this picture. 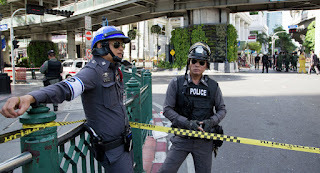 It shows some different members of the Royal Thai Police, as far as I know, but they were certainly comparable in appearance and demeanor). Now I don't speak Thai, and I really don't know much about their local jurisprudence. But I did my best to explain the situation. I showed them the bump, and indicated with lots of sign language what had happened. Their response shocked me. They LAUGHED in my face. Not a little bit. A LOT. Then they walked away, still chortling and (I believe) imitating me, mockingly. I assumed that I wasn't being understood (due to the language barrier) , so I approached them again, with heightened urgency. I used my phone to translate the essential facts into Thai, drew out a clear timeline diagram using easily understood symbols, and outlined my recommendations for action. 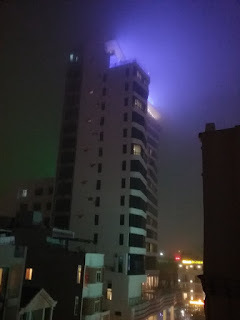 I knew that it would be difficult for them to locate the specific mosquito responsible, but I thought they would probably want to take some basic precautionary measures: Sealing off a 4-6 block radius, calling in some helicopters to spray the area, and broadcasting warnings over local media stations. Naturally there would also be the formality of reports, photographs, forensic lab work, and so forth. I was prepared to do everything I could to assist them (and remember, I am supposed to be on vacation). Bottom Line: I had little hope that my precious blood would be returned to me in usable condition - I had basically written it off, and was now just trying to do my part for justice and public safety. But the police response to my patient and thorough (albeit tensely delivered) explanation left me speechless. THEY. DID. NOTHING. In fact, their attitude made it seem they felt like I was wasting THEIR time. But the question of misunderstanding was now past us. They knew EXACTLY what I was saying. Naturally I was dumbstruck. What is the purpose of police, if not to respond to violent attacks on tourists? Rather than further escalate the somewhat tense situation, I (wisely, I think) did my best to remain calm. I returned to my hotel room and performed first aid on this subtropical insect bite MYSELF. I then clenched all my chakras into an angry helical spiral, and performed several hours of cleansing breath exercises (not "anxious panting", far from it) in hopes of neutralizing the insecto-toxins and whatever harmful viruses may have penetrated my skin and aura. Eventually, I fell exhausted into a feverish slumber, tormented by apocolayptic dreams of interphylum savagery. 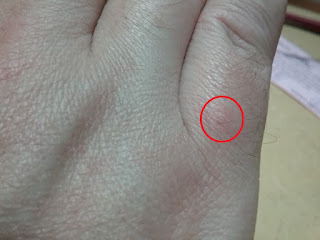 The next morning my itchy finger bump was undeniably still present, perhaps even slightly larger, and noticably redder. I wrapped it carefully in moist banana leaves, then dressed hurriedly and proceeded directly to the Royal Palace, hoping for an audience with his majesty, King Vajiralongkorn. To be honest, I was expecting his majesty to already be apprised of the situation. I guessed that the irresponsible lawmen from the previous night had probably realized their terrible mistake and, with great embarassment, notified their monarch of the incident. 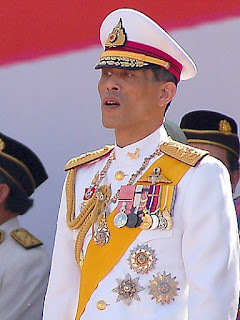 However, it turned out that I was again thwarted, as Friday was in fact Songkran Day (New Year's Day), and his excellency was engaged in various ceremonial duties, unable to receive petitioners. At least, that is my interpretation of what the palace guards told me (a bit dismissively, I thought). At that point, I decided that it did not make sense for me as a visitor to continue to try to impose my views regarding the unfortunate situation. Apparently when a visiting american tourist gets violently bitten by a mosquito on his right pinky finger, it is no big deal as far as the authorities of Thailand are concerned. 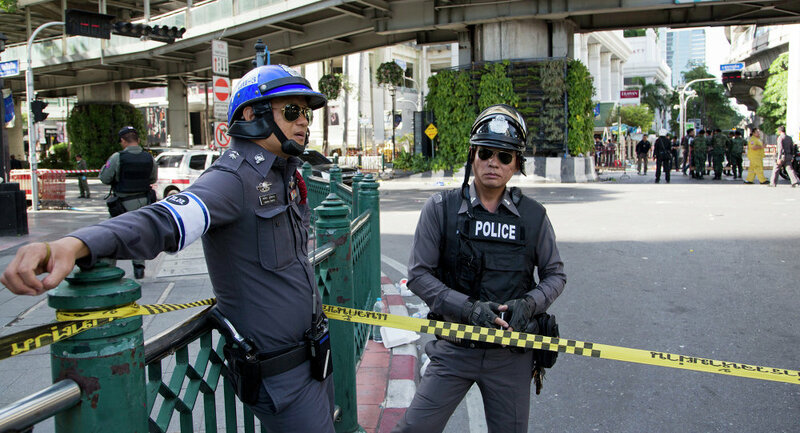 Perhaps if we were not in the middle of the Songkran festival there would be more resources available to address the situation, but it is useless to speculate. I will just chalk up this experience as a lesson learned about cultural differences, and continue with my journey, as best I am able. exactly8 lucky months from tonight.